Why celebrate National Surf & Turf day only once every 4 years? Celebrate February 28. And, who said that enjoying surf and turf has to break the bank? Enjoy Da Lobsta’s creative twist with its Surf & Turf Lobster Roll, only $12.95 at both Chicago area locations, including the 12 E. Cedar St. location and the Chicago French Market. 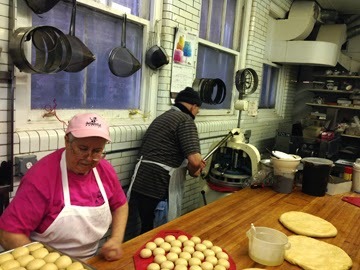 Delightful Pastries Gets Ready for Paczki Day. 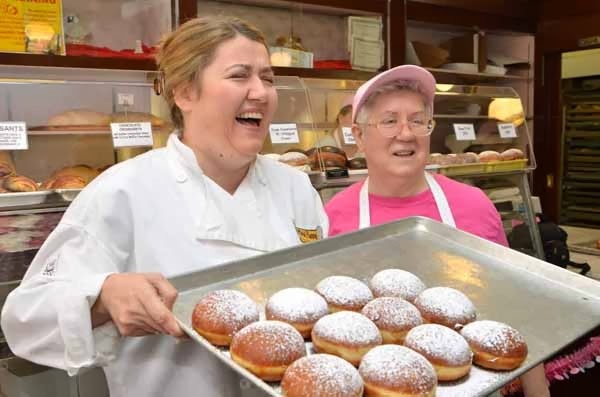 Have you ordered your Paczki? 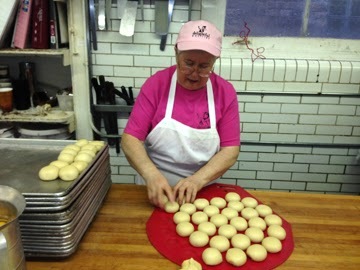 If there ever was a question as to whom rules the queendom of Paczki making in Chicago, these photos will help solve the query. 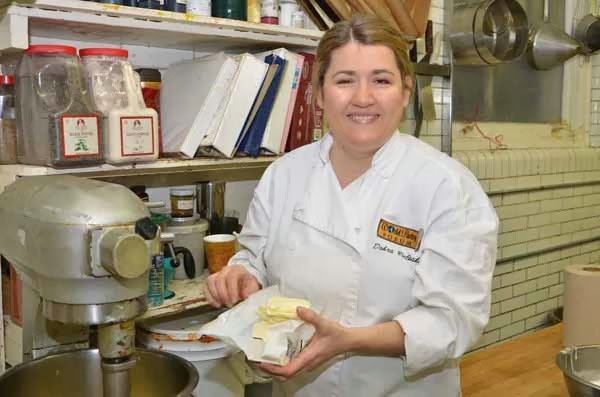 The mother-daughter team of Stasia Hawryszczuk and Dobra Bielinski, partners of Chicago’s Delightful Pastries with brother Robert Hawryszczuk, and his wife Nico Hua rule the roost. 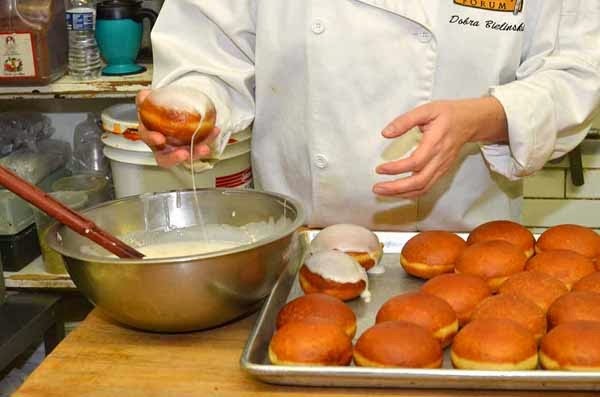 The team, with a handsome able-bodied staff of helpers, is cranking out delicious homemade Pasczki to the tune of 1000s per day to meet pre-order demands of 36,000 plump and delicious filled authentic Polish Paczki. 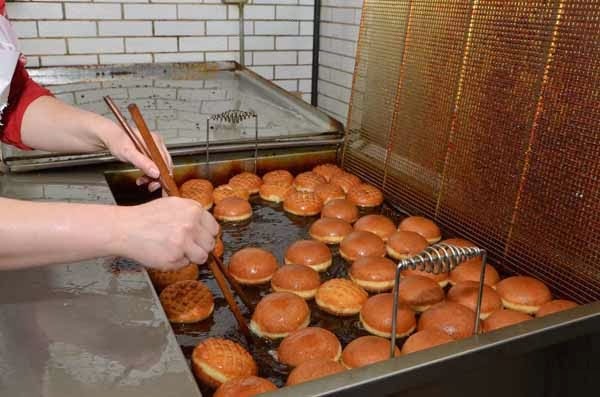 If you think Paczki are the same as doughnuts, think again. 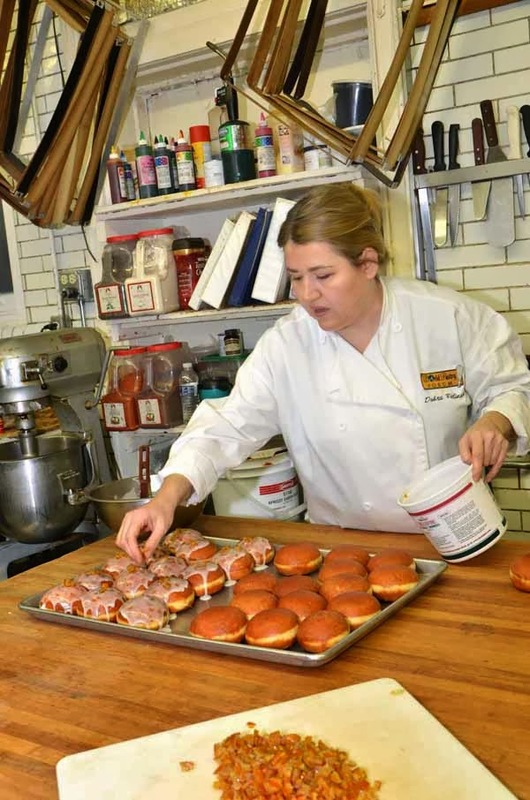 The traditional Paczki is “all about the dough. 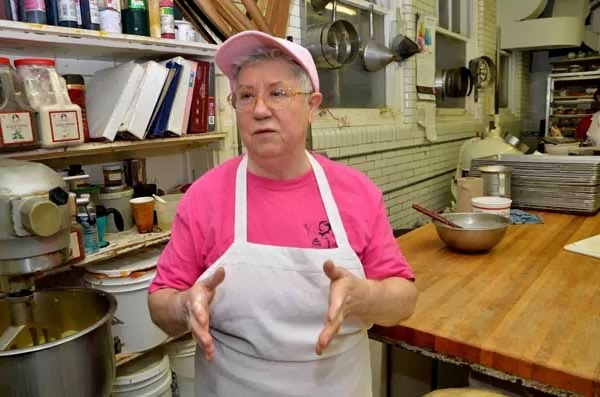 It’s denser; it’s a yeast dough that doesn’t collapse when you bite in,” said Dobra. “One of the reasons ours are so good is that we don’t use any additives; everything is from scratch – flour, sugar, water, eggs are the base. : Paczki day is an annual tradition celebrated in Poland tomorrow (on the 27th of February) but here in America, it’s celebrated on March 4, Fat Tuesday.” Whether you’re a purist, choosing traditional varieties such as Fresh Strawberry & Whipped Cream, Custard Topped with Chocolate Fudge, Apricot Jelly, Raspberry Jelly, Rose Petal Jelly, Plum Butter, or want a gourmet flavor such as Cannoli Paczki or Passion Fruit Jelly, there’s a Delightful Paczki for every taste. 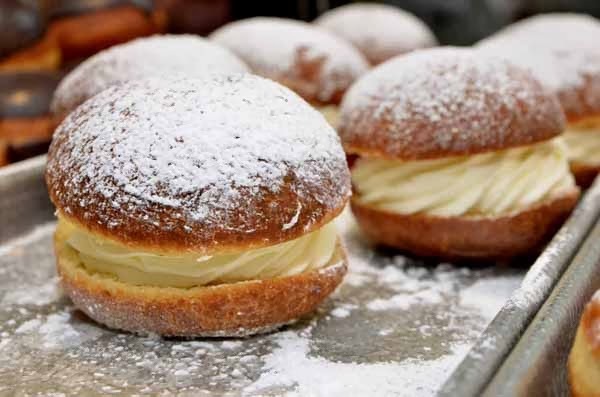 However, it’s Delightful Pastries “drunken” Paczki that has had helped Delightful make its mark nationally, with three booze-filled choices: Jameson Whiskey with Chocolate Custard, Vodka and Custard with Madagascar Vanilla, and Lemon Curd with Moonshine. All three Chicago area Delightful Pastries locations (Jefferson Park on Lawrence; Old Town on Wells and the West Loop at the Chicago French Market) will be fully stocked. Prices range from $2 to $3.25 apiece. Come hungry. It’s impossible to just eat one. Like Delightful Pastries on Facebook and Follow on Twitter @DelightPastries. Visit http://www.delightfulpastrries.com for more information. 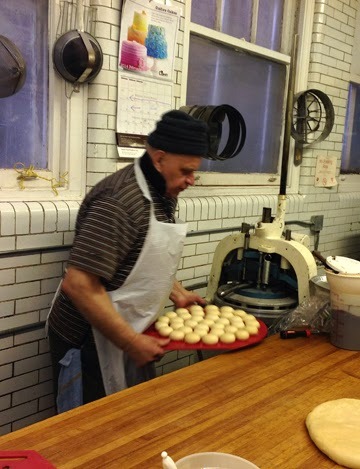 You can order Paczki at the Lawrence Ave. bakery at: 773-545-7215. Reprint from our friend and client Chef Francois de Melogue's blog "Eat Till You Bleed," kind of says it all. Francois is the executive chef of Figue Mediterranean in La Quinta CA. 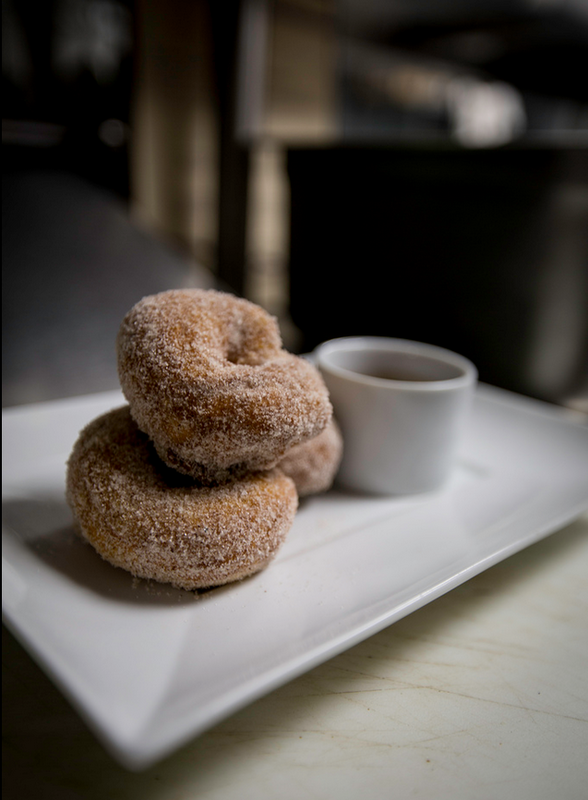 Since Chicago is donut obsessed, we couldn't pass up sharing Francois' delicious Moroccan Donut with Harissa Hot Chocolate #recipe. Beyond fabulous. Perfect for getting out of the winter doldrums. Who doesn’t love a great donut? Mmm, those sugary feathery light deep fried puffs rolled in sugar warming your belly and soul. Donuts are pure magic. They transport me back to an earlier time when food could cure all that has gone wrong in life. Donuts, confectionery alchemy at it’s best. Flour, sugar, butter and eggs transformed into sweet delectable pillows. Donuts, proof that God does exist. All this donut talk has nearly caused me to short out my keyboard from the anticipatory drool. I do understand why I am fat. I love food and quite honestly food loves me. I won’t kid you, making these donuts at home will take some skill and patience. Anyone can do it. Just set aside some time, follow the recipe and prepare to enter Food Nirvana. Heat milk in a small saucepan until it is just lukewarm. Your body temperature is 98.6 degrees. If you stick your finger into the milk it should be just slightly warmer then you. Pour the milk into a small bowl and add yeast. Use a spoon to stir in 1 cup of the flour. Cover the bowl with plastic wrap and set aside until it is bubbly and slightly risen, about 20 minutes. In a food processor, combine the butter, sugar, spices, salt, eggs and egg yolks. 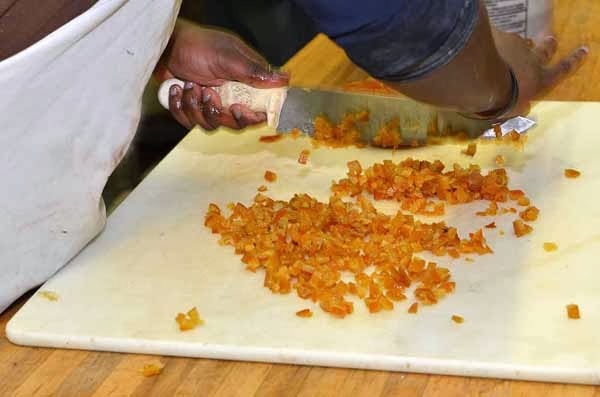 Pulse till butter is finely chopped and equally distributed throughout the mixture. Add yeast mixture and pulse to mix. Add 1 cup of the remaining flour and pulse until the mixture is smooth. Scrape down the bowl. Add the rest of the flour and pulse again until well-mixed. Let the dough rest in the food processor for 10 minutes. Weigh out two ounces pieces and roll into a log shape. Pinch the ends together, put in a warm place on a parchment paper lined cookie sheet and let rest till it doubles in size. Deep fry in 350 degree oil till brown and crispy on both sides. Roll in granulated sugar mixed with cinnamon. At the restaurant we are lucky to have deep fryers. At home I use a large heavy gauged pot filled half way with vegetable oil. I use a deep fryer thermometer to check temperature. 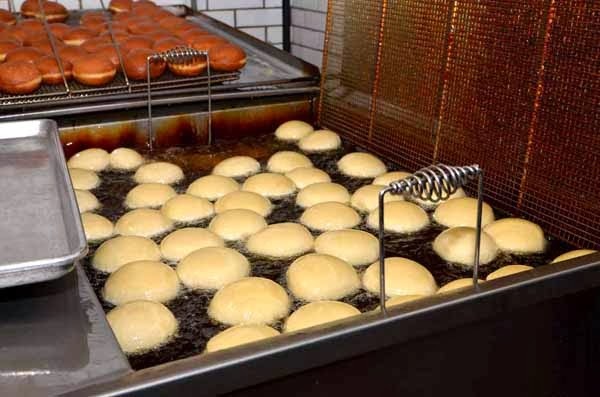 Be careful not to crowd pot with too many donuts because they will cool the oil and cause the donuts to soak up more fat. Drain donuts on a cookie sheet lined with paper towels. Combine everything, boil, pour into a mug. Caution this hot chocolate is rich and full of flavor. Your favorite powdered version will not taste good anymore. 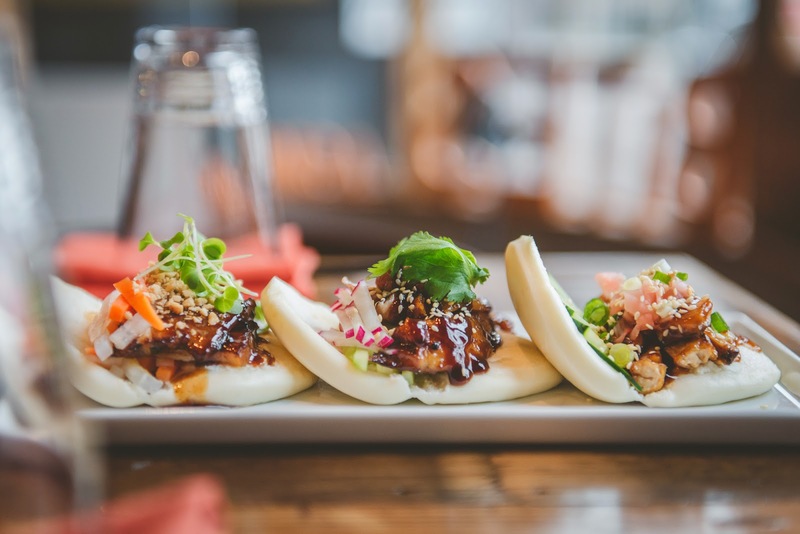 An evening of great food and wine is on tap at “Pour” in support of the Arts4Kids Foundation, 6 p.m., Wednesday February 26 at Bites Asian Tapas, 3313 North Clark, (773) 270-5972. “Pour” is a popular fundraiser that brings together wine tastings and social awareness. The event features wine and food pairings, as well as special tasting experiences, all in support of a non-profit organization. Pour events have raised funds for several local and national charities. Arts4Kids aims to introduce children to a variety of arts, hence fostering intellectual and emotional growth as well as enabling to spear through the cultural bearers. Its founder Leonard Mogul has help sponsor cultural trips for underprivileged kids across Chicago. “It's important that these children are exposed to a different atmosphere and understand there is so much more to life than the small piece of the world they see,” said Mogul in a recent interview. Vietnam. The tapas are perfect for sharing. The restaurant’s crafted cocktails are Asian-infused and carefully created to complement the dishes. 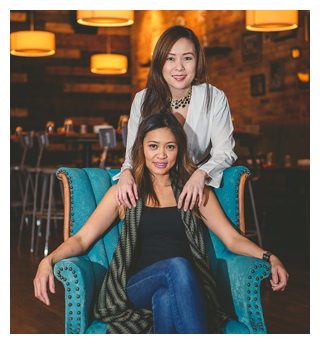 Bites, which opened this past fall in Lake View, is co-owned by chef Marita Tantivirasut and entrepreneur Asana Nakornchai. Tickets to Pour are $25 in advance for tickets and for more information visit Eventbrite.com. 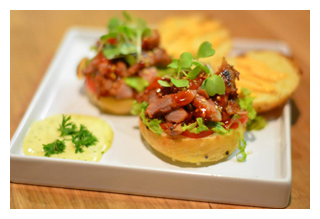 For information about Bites Asian Tapas, visit BitesTapas.com. Like Bites Asian Tapas on Facebook and follow it on Twitter @BitesTapas. 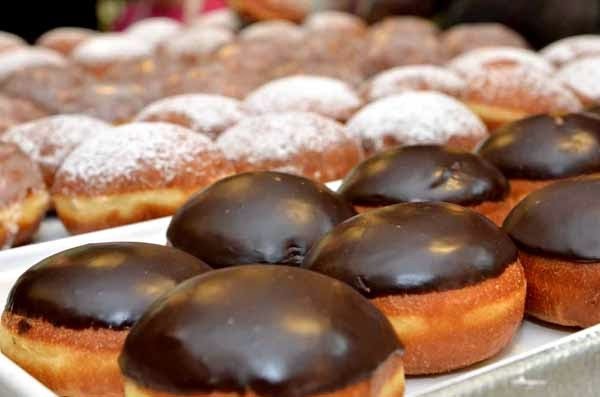 Delightful Pastires is offering a baker’s dozen special: Buy a dozen paczki and GET ONE mystery flavor PACZEK FOR FREE, offer good through 2/19/2014. Did someone say Drunken Donuts? You heard us right. 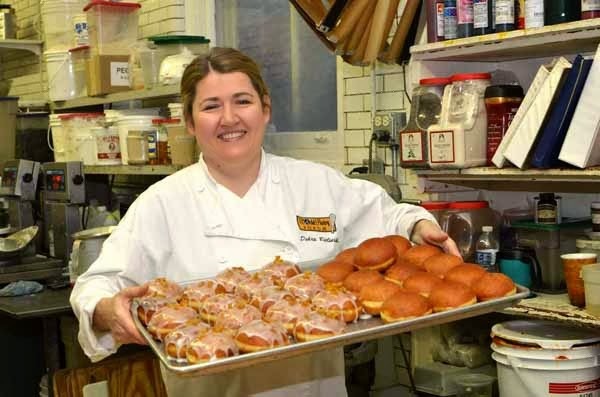 Delightful Pastries has made their Drunken Paczki famous. Three varieties that you’ll be over the moon about: ... Jameson Whiskey with Chocolate Custard; Vodka and Custard with Madagascar Vanilla, and Lemon Curd with Moonshine (available at all three Delightful Pastries locations). Stop by Prairie Grass Cafe (601 Skokie Blvd. 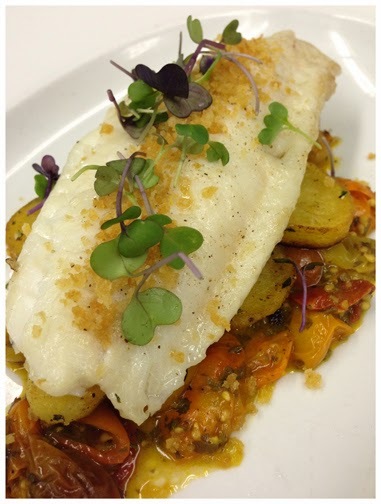 Northbrook, IL 847-205-4433) tonight (February 10) to enjoy Chatham Island Blue Cod . 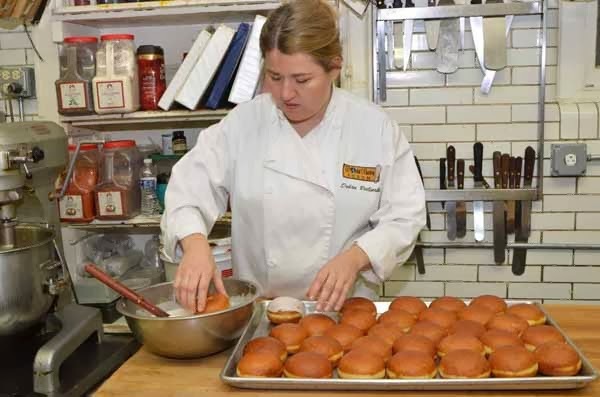 Chefs Sarah Stegner and George Bumbaris are preparing it baked in olive oil with lemon, toasted bread crumbs, roasted cherry tomatoes and served with sautéed potatoes ($40). 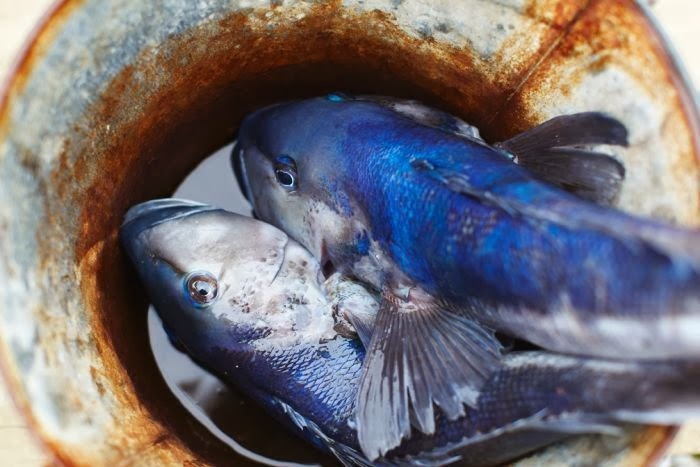 Blue Cod are found throughout New Zealand, but are most common south of the Cook Strait and around the Chatham Islands. They are found at depths to 200 m in sandy areas and feed on shellfish, crustaceans, scalps and small fish. Situated in the South Pacific Ocean, about 800km east of Christchurch, the Chatham Islands are New Zealand’s most easterly region. An archipelago of 11 islands, only Pitt and Chatham are inhabited, by about 600 people. These bright blue fish are an island favorite but hard to find in the states. Unique to the New Zealand region, the cold clean waters make the Chatham Island Blue Cod’s flesh firm yet delicate with an intense ocean fresh flavor. Check out this video of how Blue Cod is caught. If you're looking for a special way to celebrate Valentine's day, these Chicago area businesses have something to offer every budget. Whether you're looking for an intimate romantic evening, a family celebration, party ideas to celebrate with friends at home and gift ideas, these are our picks for Chicago's best. Celebrating Valentine’s weekend doesn’t have to break the bank. Big Chef Burgers (1602 E. Algonquin Rd., Schaumburg, 847-221-8539) invites you and your sweetie to enjoy a casual yet romantic evening over a heart-shaped homemade Neapolitan pizza Friday, February 14 and Saturday, February 15. Families welcome.Thirsty, sure you can share a lovely bottle of Chianti or your favorite bubbly. But if you really want a treat, try a spiked “adult” strawberry gelato milkshake with two straws. Any of Big Chef’s pizza can be made heart-shaped. The menu features a number of pizzas to suit all tastes including: Pizza Con Buffalo with Mozzarella, Prosciutto, Arugula and cherry tomatoes; Pizza Con Pancetta E Grana with tomato sauce, Pancetta and shaved Parmesan; Pizza Con Prosciutto Cotta E Funghi with tomato sauce, sautéed mushroom, Italian ham, and Mozzarella; Pizza Margarita with tomato sauce, Mozzarella and basil; Pizza Salsiccia E Cipolla with tomato sauce, homemade mild Italian sausage, onion and Mozzarella; Quattro Formaggi with Mozzarella, Gorgonzola, Brie, and Fontanilla cheeses; Quattro Stagioni with tomato sauce, Italian ham, artichokes, sautéed mushrooms, and black olives,. and Pizza Vegetariana with tomato sauce, Mozzarella, roasted pepper, grilled eggplant, zucchini, and sautéed spinach. All pizzas are $8 each. Celebrating Valentine’s weekend with special friends and family is an annual tradition and serving luscious lobster makes the occasion even that much more tasty. 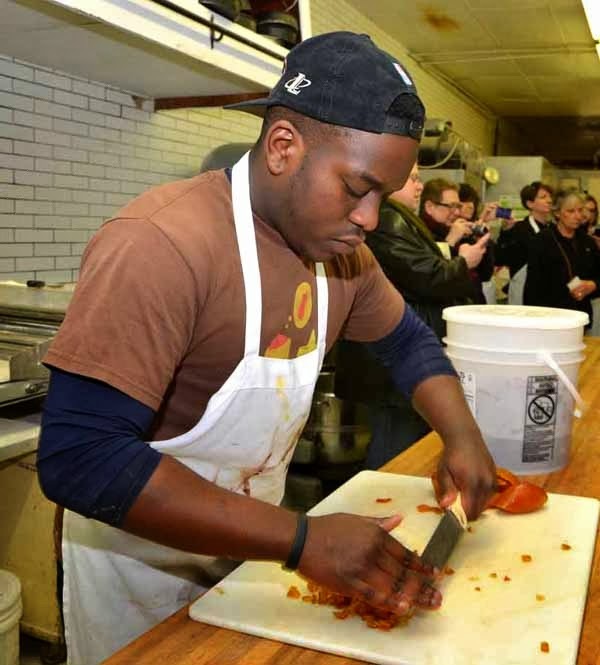 Da Lobsta at Chicago French Market and 12 E. Cedar St. has created The Perfect Party with its catered options. Create your own platter featuring a variety of Da Lobsta rolls (Traditional, Asian, Mexican, Green, Indian, Surf & Turf, and The Skinny), awesome sides (Lobster Mac-N-Cheese, Lobster-Crab Spinach Dip, Coleslaw, Spicy Butter Pickles and Cape Cod Chips) and you’ll win the hearts and palates of all of your lucky friends. February is the perfect time to celebrate great pastries and Delightful Pastries at the Chicago French Market is your go-to spot for picking up gifts that are sure to please your significant other. Delightful will custom create a special Valentine’s gift box or you can pick up one that’s been pre-made with customer favorites. Think chocolates, homemade cookies, homemade truffles and fabulous French macarons in any combination. Also special for Valentine’s Day are Delightful Pastries' luscious extra-large hand-dipped in bittersweet dark chocolate strawberries, available for $2.50 each or a baker’s dozen special (13) for $30 (the extra one is complimentary). Buy your sweetheart a gift box ($30) including gingerbread sugar cookie hearts, raspberry and chocolate Parisian macarons, cookie bag of your choice, and ¼ lb. handmade chocolate bark or ¼ lb. handmade truffles. The Delightful Pastries Amazing Gift Box is, simply said, AMAZING. For $50, you get a heart cookie sandwich with chocolate butter cream, black and white cookie – cupcake; a large box of raspberry, passion fruit and chocolate Parisian macarons; a box of rum balls - chocolate pecan turtle; maple cranberry almond granola and two chocolate dipped strawberries. And perhaps the most romantic (and certainly customer favorites) are their heart-shaped chocolate mousse torte for two ($6.75) made with a chocolate mousse and finished off with ganache made with bittersweet Belgian chocolate, and Chocolate Raspberry Ganache Tart ($30.00) with sweet buttery tart dough layered with chocolate ganache and covered in fresh raspberries with a dusting of powdered sugar. 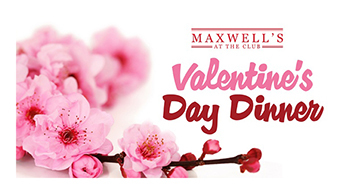 Maxwell’s at the Club (500 N Kingsbury St, Chicago, IL 60654, (312) 527-5800 x301) is celebrating Valentine’s Day with a special prix fixe menu for only $45 per person that includes choice of petite filet and lobster tail, New York strip steak, Chilean Sea Bass or Veal Medallions. The regular Maxwell’s menu also will be available. The special prix fixe dinner menu is available only on Valentine’s Day, Friday, February 14. The prix fixe menu features four courses. Choose from Duck Confit, California Sushi Roll, or Grilled Shrimp Diavolo to start. The second course features choice of Roasted Cauliflower and Black Barley Salad, Baby Red Romaine, or Crab Bisque, followed by the entrées featuring choice of Petite Filet and Lobster Tail, New York Strip Steak, Soy-Ginger Chilean Sea Bass, Pan-Seared Veal Medallion, and finally, dessert, Churros with Cinnamon Ice Cream. 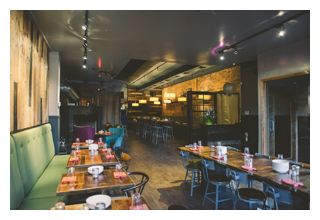 If you’re looking for an exceptional dining experience this Valentine’s weekend, look no further than Oceanique (505 Main Street, 847-864-3435) in Evanston. Recognized as the best seafood restaurant in the Chicago area and one of the top in the nation, Chef Mark Grosz has prepared a special meal – perfect for couples wishing to enjoy one of the most delicious and memorable meals ever. Valentine's will be celebrated both Friday, February 14 and Saturday, February 15. The beautiful special Valentine’s menu features five courses with or without a Champagne or wine pairings. The cost is $99 per person without pairings, excluding tax and gratuity. Add an additional $150 per person with Champagne or $69 for the "Intro", $125 for the "Premiere" or $250 for "The Grand wine pairings." The meal begins with a Chef’s Surprise, followed by your choice of Wild Maine Diver Sea Scallops, Country Pate, Butternut Squash Ravioli, Chilled Maine Basket Island Oysters, Pear Maytag Blue Cheese Salad, or Wild Maine Lobster. The third course is an intermezzo of Passion Fruit Sorbet. Choose from Wild Maine Skate, Organic Arctic Char, Nebraska Prime Filet Mignon, Organic Spanish Turbot, Eggplant Heirloom Carrots and Pea Tips, or Wild Maine Lobster for your entrée. Finish with the dessert from the chef’s pastry selections. Celebrating Valentine’s weekend (February 14 and 15) with the entire family is always special, and enjoying a great meal with your loved ones makes the day that much better. 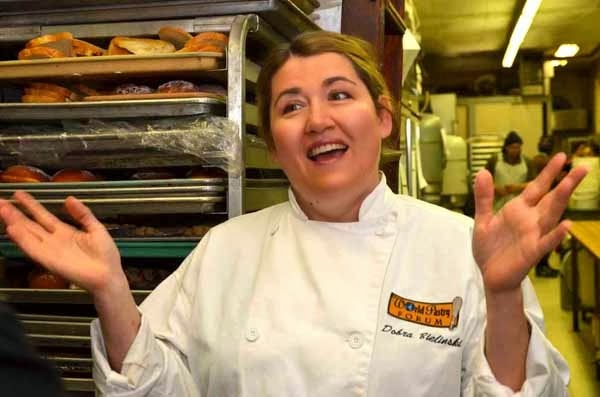 Prairie Grass Cafe (601 Skokie Blvd., Northbrook, 847-205-4433) Chefs Sarah Stegner and George Bumbaris have prepared delicious Valentine’s Weekend specials, including a complimentary heart-shaped cookie for children. The cookie recipe used is Sarah's grandmother's. The regular menu also will be available. The Prairie Grass Cafe Valentine’s Weekend specials not on the menu include: “Three Sisters Garden” Farmer Greens with Roasted Squash, Pomegranate, Pumpkin Seeds, “Pleasant Ridge Reserve” Cheese and Herb Vinaigrette, $9.50; Wild Striped Bass with Olive Oil Poached Winter Vegetables – Splashed with Aged Balsamic, $34; “Creekstone” All-Natural NY Strip with Sweet Potato & Bacon Gratin, Ragout of Mushrooms, $39, and Thin Apple Tarts with Crème Anglaise, $10. A separate children’s menu is available as is Prairie Grass Cafe’s regular menu. Dinner is served from 5 p.m. to 10:30 p.m.; the Valentine’s Weekend specials will be available on both Friday and Saturday night (February 14 and 15). Featuring all Natural Icing – No Food Dyes! Mix together the flour, baking powder, salt and sugar. Cut the butter into the flour mixture. Add the egg, cream and vanilla. Blend thoroughly. Chill the dough. Roll the dough out on a floured surface to desired thickness and cut with heart cutter. Bake cookies at 400° for 8-12 minutes or until very lightly browned around the edges. Allow to cool and frost with natural pink frosting. In a mixer blend the butter and sugar – add the cream and continue to beat until smooth. Add the vanilla and mix well. Using a coarse microplane grater – grate approximately 2 Tbsp of red beet into frosting. Stir by hand with a rubber spatula till frosting is bright pink. 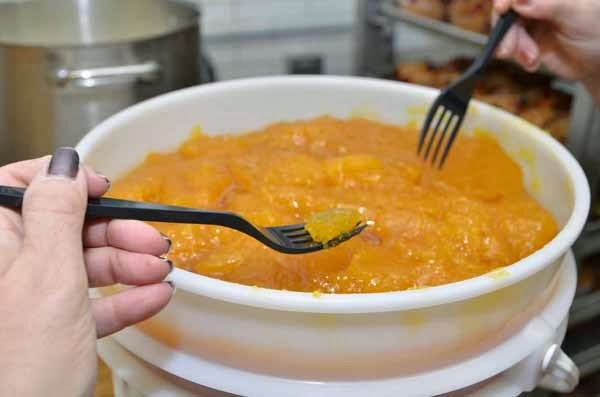 Transfer the frosting to a sieve and push through using the rubber spatula, leaving the beet pieces in the sieve. Waterleaf restaurant (425 Fawell Boulevard in Glen Ellyn, Ill, telephone: 630-942-6881), provides the perfect setting for a romantic Valentine experience. The contemporary dining room overlooks a scenic lake nestled on the campus of College of DuPage. The restaurant also features a beautiful fireplace. Waterleaf is now taking reservations for Valentine’s day and the accompanying weekend. Diner’s will select from the ala carte dinner menu. The adjacent Inn at Water’s Edge offers a Romance Package for the entire month of February. Celebrate love and romance with an overnight stay at Inn at Water’s Edge. The Romance Package is $150 per night plus tax and is available throughout February. 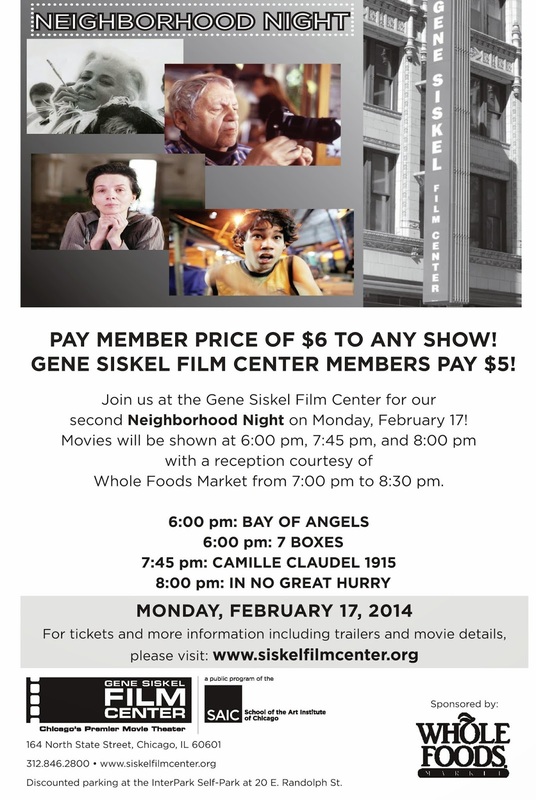 Reservations are available by calling (630) 942-6888.